Tokyo Xanadu is ranked in the 56th percentile of games scored on OpenCritic. Complaints aside, Tokyo Xanadu is nothing short of engaging action RPG goodness that'll have you coming back for more. Tokyo Xanadu is a massive game with a lot to offer. I could keep talking a lot more about it, but I think you get a good idea of what you can expect from this PlayStation Vita release. If you're looking for a solid action RPG release for Sony's portable, then I recommend you get Tokyo Xanadu. The game's look is great, and its gameplay is flawless, not to mention it has a ton of content available for you, as well as a shiny Platinum at the end of the road! Tokyo Xanadu is basically Falcom trying to create a Persona like game with their own signature flavour and a pretty damn good experience overall. Trading spell books for cell phones, Nihon Falcom proves once again that they are masters of the action JRPG subgenre. I love Tokyo Xanadu for what is: a solid action RPG with a dramatic premise and an awesome cast of characters. The game impressed me with the responsive battle controls and beautiful special attacks. Even though the story didn't amount to the standards Falcom has set in the past, Tokyo Xanadu truly shows what the PlayStation Vita is capable in terms of graphics and playability and I would happily play through the game again. As with most Falcom games, the game feel is straightforward and kinetic, paired with a vanilla aesthetic that's more inoffensive than groundbreaking. I can't fault a game for not being ambitious enough when it's following a tried and true formula and does it without any perceivable blemishes at all. Tokyo Xandu is an attempt from Nihom Falcom to tackle the Persona series. It is a solid RPG on its own although it is hard to draw comparison to the genre it targets here, but it has more than enough unique features to make it stand out on its own. After the first few hourse, we thought of Tokyo Xanadu as an uninspired Persona 5 clone. After more than seventy hours in, we think otherwise: this is one of the finest action RPG Vita has seen in the last few years. Tokyo Xanadu is an enjoyable Vita title with fun combat, mostly enjoyable characters, and an overall solid gameplay. It does lack in storytelling elements and falls on generic tropes, but it is worth picking up if you love anime based games, JRPGs, social systems in games, or Falcom games. Tokyo Xanadu is a great fit for the Vita, as the repetitive chapter formula seems to be made for short bursts of play. If you're going to pick it up at all, buy the Vita version; don't wait for the PS4 release later this year. Those looking for a fun little action-JRPG for the Vita will most certainly enjoy their time in Morimiya. You'll probably also never look at a camera store the same way ever again. In theory, combining two of my favorite games into one sounds like a foolproof way to make one of the best games of all time. Unfortunately, the reality is not quite so grand as the mixture of the two elements has diluted the unique flavors to something that feels lacking but not entirely unpalatable. This is not the Persona you're looking for, but battles are a blast. Released in Japan in 2015, now coming to North America is another installment in the Xanadu series, Tokyo Xanadu. Tokyo Xanadu follows the adventures of Kou Tokisaka, as he fights the supernatural labyrinths that are appearing in the city of Morimiya. 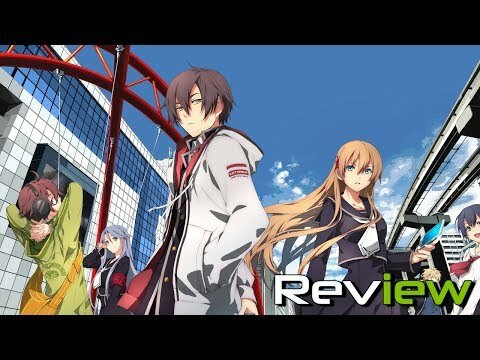 With interesting characters, a good storyline, and a really solid soundtrack, there was a lot I liked about Tokyo Xanadu, despite some of its flaws. Tokyo Xanadu is a game I really wanted to enjoy. Not to say that I don’t like it, because I do, but I was expecting a bit more. For what it eventually excels at in dungeon design, it lacks in combat. For what it excels at in world building, it fails in originality and almost feels by the book. I’m not sure what Falcom was trying to accomplish by trying to make Tokyo Xanadu a derivative of their Trails franchise. I’m not happy or even upset that they do, but what they do leave me as, is very confused. A lot feels right with Tokyo Xanadu, with gorgeous handheld graphics and a concept with a lot of potential, but the complete product chooses overall accessibility for depth of concept. Combat, narrative, and development do their job just enough to keep things working, but the hiccups and shortcomings keep holding the game back from the niche sleeper hit it could be. If someone is going to borrow, there is no shame in borrowing from the best. Pretty good jRPG about urban legends in today's Tokyo. It's a shame that the game uses many mehcanics from another titles, but has no original ideas on its own. Tokyo Xanadu is a good fit for the PS Vita with its ease to play in short bursts. There's also lots to do in this game aside from the main quest. It will undoubtedly be enjoyable to fans of action RPGs. This original release is still a bit of a disappointment and leaves a mixed impression. If you are looking for a solid JRPG for Vita, this is a fully complete game, but for those wanting the absolute entire package, I would recommend waiting for the definitive version. Tokyo Xanadu proves that Falcom can do no wrong, but at the same time, it proves that your strength is in celebrating what they've built through all these years and not in getting inspiration from other games. Despite a repetitive structure and some boring dungeons, Toyko Xanadu‘s action-based combat was effective in keeping my interest. The characters are also generally quite likeable, with their relationships and quirky personalities coming off as genuinely enjoyable. The combat here is good, really good, and for some, that may be all they need. For you, that may be enough to convince you to plop down your $40 for this game. For me, the fun in Tokyo Xanadu is buried beneath so much unskippable, unpauseable, and unmemorable story I can't in good conscience give it my full support. Tokyo Xanadu is a surprisingly generic Persona wannabe from a developer that I know can do far, far better. Overall, Tokyo Xanadu has a few quirks here and there, but I still had a fun time battling Greeds and bonding with my in-game friends. Despite the obvious flaws in its plot, Tokyo Xanadu more than makes up for it with its fast-paced action and combat system. If you want to dust off your Vita and play a new action RPG, I would recommend picking up the game. While there are better JRPGs on the Vita, Tokyo Xanadu may fill that dry spell between major releases. Combat can be fun and going through dungeons is almost meditative in that it requires little energy. Trying it on harder difficulties may be the way to go for those looking for a tougher system to play with. Story wise though, there’s not much to celebrate.